Large Format Laminating: Does it have to be hand fed? Koenig and Bauer (KBA) have always been one of the world’s leading manufacturer’s of sheet fed, offset presses, manufacturing top quality presses capable of up to 18,000 SPH. Their Rapida 145 (max sheet size of 1060mm x 1450mm- approx. 41.75″ x 57″), are especially popular with printers looking for large format, solutions. More recently the introduction of the Super Large Format KBA Rapida 185 and 205 sheet fed, offset presses has expanded capability even further to allow customers to print up to max sheet sizes of 1300mm x 1850mm (approx. 51″ x 72.75″) and 1510mm x 2050mm (approx. 59.5″ x 80.75″) respectively. This range of Super Format KBA’s are capable of speeds of up to 9000 SPH, an outstanding level of productivity for that sheet size. Many printers and trade finishers know that laminating not only protects print, but greatly increases its perceived value. John Gilmore, Managing Director of Autobond Ltd. often suggests, “The perceived value of print is all above the ink”, i.e. laminating, spot UV/raised UV, and foiling processes greatly increase its value. So printers or finishers looking to laminate print off of the KBA Large Format, and now Super Large format lines, are faced with a problem-What type of equipment can even laminate that large of a sheet? Historically, they turned to very slow, hand fed, laminating machinery, that is not engineered for the demands of high volume workloads. Further, said laminators often require very expensive pressure sensitive laminating film to achieve decent adhesion on such wide sheets. Several years ago, recognizing a gap in the market, Autobond developed the Autobond FL 106 x 145, a line of machinery that can run the KBA 145 sheet size portrait-fully automatically. 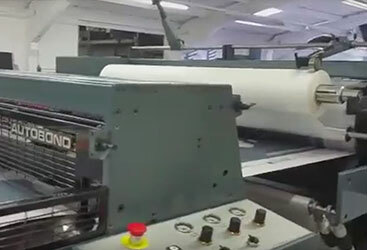 Utilizing a Heidelberg Speedmaster 102 feed head, and equipped with a vacuum feed table, large water heated laminating rollers, a steer and pull “bursting” separator, and vacuum stacker, this machine can handle such large sheets effortlessly. See it here running 106cm x 145cm (41.75″ x 57″), exceptionally light weight 70 gsm (50lb text) print, at 60 m/min (200′ per minute) or 2500 SPH. To handle the Super Large Format KBA 185 and 205 sheet sizes, Autobond recently developed the 155 VLF (Very Large Format) laminator. This machine utilizes a top loading, bottom sheet feeding semi-automatic feeder, consisting of 3 x Heidelberg/Stahl suction drums, to laminate sheets as thin as 150gsm (100 lb text) up to 350 gsm (14 pt) at up to 45 m/min (150′ per min) or 1300 60″ x 81″ SPH, one or two sides in one pass. The first one, affectionately known as “Big Rose”, was installed with Rose Laminating, a long time Autobond customer in Ohio, USA. With a massive 14″ diameter chrome laminating roller, this machine can run standard thermal OPP at a fraction of the cost of the pressure sensitive film equivalent. For more information and video on this machine click this link.